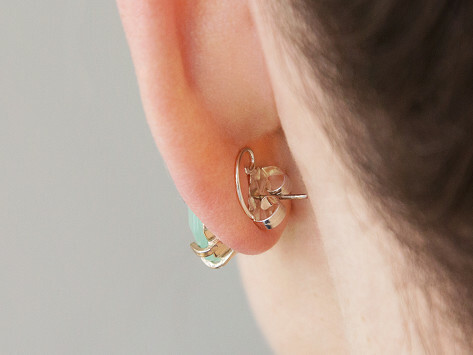 These earring lifts keep heavy studs and other sparklers upright and secure. They offer added support at the back of your ear and are a great solution for stretched out holes. Just swap out your standard post backs to prop up your favorite pair. Dimensions: 0.49" x 0.4" x 0.19"
No more droopy earrings! I usually wear studs, but hated how they drooped down. The Levears stop this from happening! These are a wonderful idea and the Grommet had them at such a reasonable price. Grommet always carries unique things. With over 30 years experience in the retail jewelry business, Maker Robin Levinson knows a lot about earrings—and how to make them look their best. She saw her customers struggle to get their earrings to sit in just the right spot on their ears. For some, a stretched out hole was the problem. For others, the earrings were just too heavy and uncomfortable. When she couldn't find a solution, she decided to make her own.